Our Facility — Therapeutic Riding, Inc.
“So many of our dreams at first seem impossible, then they seem improbable, when we summon the will, they soon become inevitable.” Christopher Reeve. 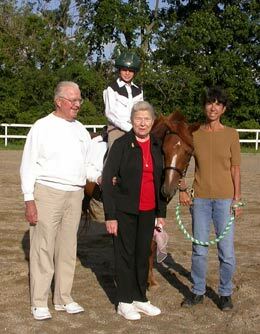 Therapeutic Riding, Inc. grew steadily from inception in 1984 to accommodate 33 riders in 1997. The generosity of Domino's Farms Land Development allowed us to expand rapidly to full capacity of 100 riders from 1997 to 2001. But the wait list continued to grow as well. With no opportunity to expand at our Joy Road facility, TRI was forced to inform over 100 potential riders that they would have to wait two to three years at a minimum for an opportunity to participate in the program. After considering all options, the Board of TRI determined that it would not be possible to enhance our existing facility or expand without jeopardizing the existing program and resolved to continue to provide the best possible program in the context of our limited resources. This all changed with the generous donation of operating funds from 2001 to 2005 including over $100,000 in gifts from Harold and Kay Peplau to provide sound financial footing for our existing program and culminated in an unsolicited extraordinary pledge of $1,000,000 from the Peplaus for the construction of a new barn and arena. Thus began the next stage of the dream: refining the vision and plotting a path towards success. With the initial pledge from the Peplaus in hand, the search for land began. It culminated 18 months later, when a partnership between the Lloyd and Mabel Johnson Foundation, The Legacy Land Conservancy and Therapeutic Riding, Inc., was forged. With the establishment of a conservation easement to protect the land in perpetuity, TRI purchased 46 acres in Pittsfield Township at a fraction of its market value. Fundraising continued as the site plans and blueprints were drafted and work commenced with the Pittsfield Township Board of Review to obtain the necessary code approvals. With a total projected cost of $2.07 million dollars, we continued to work towards raising the balance of the funds. To help us cross the finish line, the Lloyd and Mabel Johnson Foundation came forward again with a remarkable offer. The Johnson Foundation matched every dollar we raised up to $250,000, from January 1 though November 30, 2010. This challenge helped TRI complete the fundraising campaign. Over $500,000 was raised from a group of donors who wanted to make our dreams come true. On May 25th, 2010 we broke ground and started construction with the oversight of our board member extraordinaire- Jake Haas- and our partners E. T. Mackenzie Company (site development) and Century Construction (building of main barn and hay barn). We began looking for a partner to help us with the caretaker’s house. Washtenaw Community College came forward with the offer to donate a house built by its construction program. All we had to do was move it from their parking lot to Morgan Road and finish the interior of the house. Hence another unique partnership was forged. Cristy Lindemann, a WCC faculty member and her building program students assisted volunteers Bruce Robinson, John Hicks, Mark Thompson and Mike Hommel as they donated hundreds of hours transforming a shell of a house into a home. On December 10, 2010, construction was complete and the Harold and Kay Peplau Therapeutic Riding Center was officially dedicated to honor our lead benefactors and their generous gifts. On December 20th, another of TRI’s long time friends and supporters, Joel Greenisen, arrived at Joy Road with his trailer and helped us move our precious cargo of horses to Morgan Road. The trailer traveled down our driveway- Greenisen Way- named not only for his extremely generous gift to the Capital Campaign but also in recognition of all Joel and his late wife Carol have done for the program throughout the years. This was followed by countless volunteer hours to move all our equipment to our new home. After a month of settling in and familiarizing themselves with their new surroundings, the horses declared they were ready to get back to work. Finally, on January 31st, 2011, our first riders took to the arena. As we stood by on that chilly Michigan day, warmed by the radiant heaters in the arena, gazing at the smiles of joy on our students’ faces, the words of Christopher Reeve reminded us that nothing is impossible. A dream that was initially daunting has become reality due to the generous support of so many who shared the same dream.